William Hill is a British bookmaker with a long-standing tradition. Bets have been placed at William Hill since back in 1934, with sports and social events featuring heavily. However, in the age of the Internet, William Hill has been able to hold its ground as one of the best and most popular betting providers around. In the following William Hill test report, we have put William Hill to the acid test. We have carried out the ultimate test, and as a result, we can answer some of the most important questions regarding, among others, the betting portfolio, odds and customer service at William Hill. In addition, we give you a well-rounded evaluation concerning the respectability and security of the bookmaker in question. Anyone who can hold their own in the same market for over 80 years certainly deserves the trust of its customers. The name William Hill is now synonymous throughout the United Kingdom, with the betting provider having proven over a long period that they operate away from scams or rip-offs. The company has been operated seriously for years and enjoys an impeccable reputation within the industry. As well as this, William Hill is the official betting partner of the English football association. Online sports betting is offered by William Hill thanks to a valued EU-licence from Gibraltar, with the bookmaker employing more than 15,000 co-workers, as well as having millions of loyal customers across the globe. Beside their online offers, William Hill also operates various brick-and-mortar betting shops, located in almost every city and town in the UK. Elsewhere, William Hill has been quoted on the London Stock Exchange for many years, meaning that they are required to disclose their business finances on a regular basis. With the British financial authorities always keep a stern eye on all companies which are quoted on the London Stock Exchange, more transparency can hardly be expected! In the UK, there is an old saying – “At William Hill you can bet on everything” , and our test review reveals that this is certainly true. It is amazing how regularly the bookmaker offers various online bets, on events away from sports. Whether it be on the outcome of political elections, the lottery numbers or the results of a reality show such as “Big Brother”, At William Hill, you will certainly find a market suitable for you. Furthermore, William Hill scores well thanks to their great selection of football bets. Football is the clear number one at the betting portfolio of William Hill. Of course, as a British bookmaker, it undeniably prioritises the leagues in England, Scotland and Ireland. At weekends above all, various bets are offered down to the amateur divisions in England. Elsewhere, fans of German football also get their money’s worth at William Hill, as there are not that many bookmakers where you can place bets on matches from the different German upper leagues. Those who enjoy football from around Europe are certainly in the right place at William Hill. Overall, the bookmaker has some 30 sports in its programme. Among them, beside football, you will find popular disciplines such as tennis, ice hockey and basketball. Elsewhere, more exotic types of sports like cricket, snooker, volleyball or Gaelic football, which is popular in the British region, can be bet on at William Hill. In the sector of live bets too, William Hill attaches great importance to football events. Thus, not only matches from the Premier League or the Champions League can be bet on, but also on numerous matches in the amateur or even junior divisions from around the globe. William Hill deserves extra credit for its strong offer regarding live tennis bets. Not only, like at some competitors’, the matches of the ATP and WTA tours are in the portfolio, but also almost all matches from smaller Challenger tournaments. A further plus point is the “Cash Out” function, which is popular among betting enthusiasts, allowing winnings of bets to be claimed prematurely. The live stream selection of William Hill is outstanding, however it does have a snag for customers based in certain European countries. Live streams can only be received in Great Britain, with horse racing being the only exception. The level of betting odds at William Hill is among the absolute leading group of all bookmakers. On average, the odds key lies between 94 and 95 percent, with the odds perhaps the best throughout the most important football leagues. 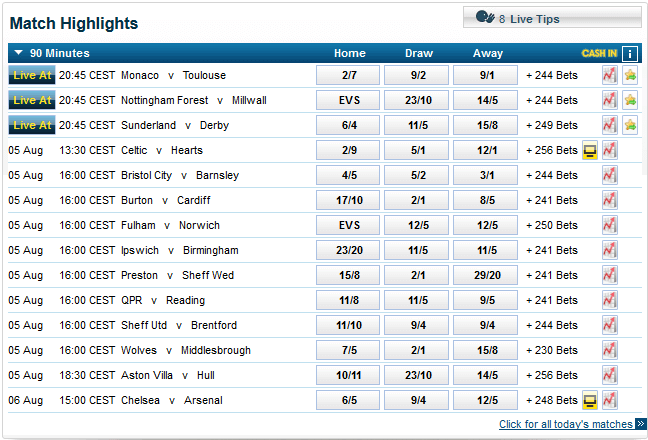 Here, the best odds of the day are often found at William Hill. The time at which a bet is placed does not play a large role at William Hill, because the odds are stable up to the beginning of an event as a rule. In our test, contrary to some competitors, we were not able to determine any tendency worth mentioning towards favourites or outsiders. The odds at William Hill are very balanced according to our review. 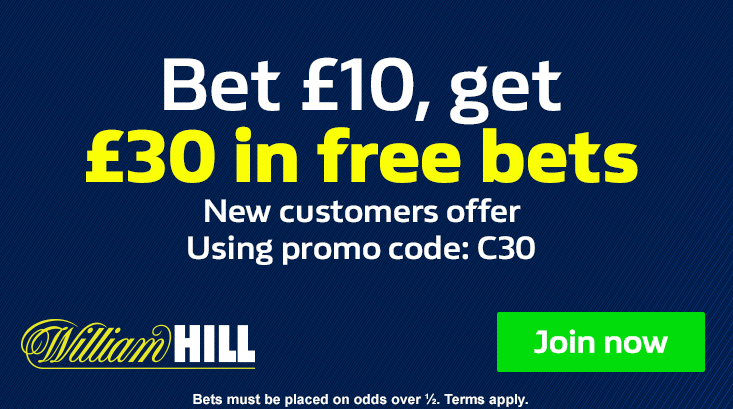 The William Hill Bonus for new customers within the UK and Ireland currently amounts to free bets up to a maximum of £30. In order to claim this bonus, during registration, you must be sure to enter the bonus code “C30”. If you forget this detail at the beginning, the new customer bonus cannot be activated afterwards at William Hill. It is also important to note that the bonus is not credited immediately after the first deposit. According to our review, this can take up to three hours. The minimum deposit amount is set at £10 by William Hill. Afterwards you must place a first bet of at least £10 on a selection with single/cumulative odds greater than 1/2 (1.5). Once this bet is settled, the 3 x £10 free bets are triggered, thus giving you a total sum of £30 to bet with. Unfortunately, customers using Skrill, Skrill 1-Tap, Neteller or PaySafe to deposit will not qualify for the C30 promotion. Free bets can be spent on any bet type, but they must placed within 30 days of award, otherwise they will expire. Please note as well that the free bet stake is not included in any winnings. Customer service also scored excellently in our William Hill test report. The bookmaker offers almost all possible communication channels to its customers. Whether it be via a simple to use contact form (which you can also attach documents to), live chat, e-mail or telephone, support at William Hill is always friendly, competent and professional. An important plus point is the fact that a completely free hotline is offered to customers as well. Written enquiries made via the contact form or the e-mail address were always replied to within 24 hours during our review, while with the live chat feature, there was also no significant waiting time throughout the week. The FAQ section at William Hill is clear, informative and and complete. Customer service at William Hill can be reached 24 hours a day, seven days a week, by phone or live chat. This is very practical and keeps pace with the 24/7 support of other leading betting providers. Enquiries via e-mail or the online form can also be sent at any time. Customers can expect an answer within 24 hours. For deposits at William Hill, customers particularly like using PayPal. An agreement with the American e-Wallet provider is a further seal of quality for the bookmaker. Besides PayPal, Neteller, Skrill by Moneybookers, iDebit, Qiwi and Webmoney are offered for deposits, among others. Especially practical for bank deposits is the option for direct bank transfer and GiroPay. With both methods, money lands in users accounts in real time. The credit card portfolio at William Hill comprises of popular providers MasterCard, Visa and Diners Club, as well as the virtual Entropay Card. For William Hill pay-outs, we were not able to give the best rating in our test report. The reason for this is the relatively long withdrawal period. Even though winnings are seriously, completely and reliably paid out, William Hill claims a fixed hold-back time of four days and only afterwards will the pay-out wish be processed. Additionally, winnings can only be paid out via a transfer option that was used for a deposit in the last 12 months. 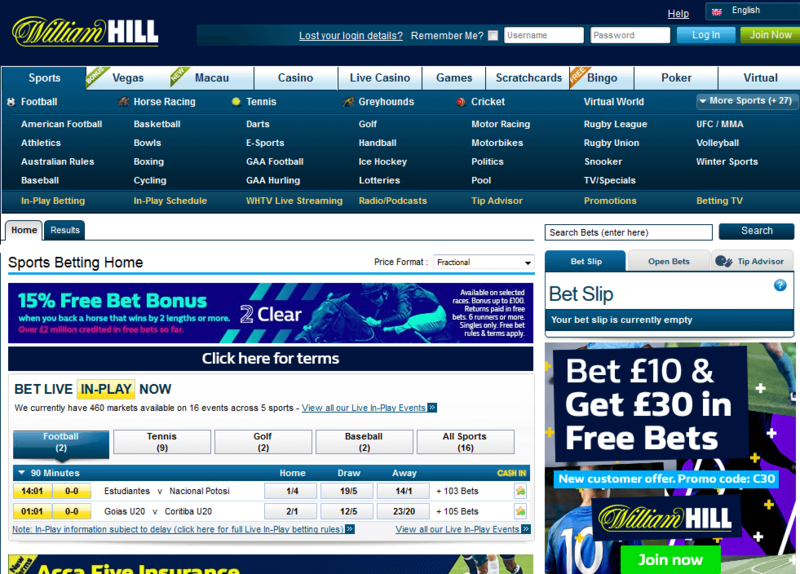 The William Hill website is structured in a way that takes some getting used to. The bookmaker clearly differentiates itself from most of its competitors in this respect. Individual sports are not found on a sidebar as is customary, but rather centrally in the menu. Below this, individual competitions from their respective countries then open up. The design is clear and the navigation easy. Optically, for years now William Hill has capitalised on the colours blue, yellow and white and this is no different for its Internet presence. On the main menu, the most important sectors of “Sports” and “Live Bets” can be selected, while underneath them, you find the corresponding sports and other popular areas, such as “Promotions & Bonuses” or customer services. Based on our review, we can conclude that overall, the William Hill website is somewhat antiquated, but definitely functional. In spite of its long-standing tradition, William Hill is absolutely up-to-date technologically. All betting offers can be used around the clock with mobile end devices, such as smartphones or tablets. Mobile users do not need to reckon with limitations, since even the live bets selection is completely available. This is also valid for all the account management options, such as deposits. Due to the website taking some getting used to, mobile customers at William Hill might even have an advantage. The menu and navigation of the app are much clearer than the desktop version. According to our review, the William Hill app is compatible with Windows Phone, Blackberry, iOS and Android. Users of iPhones and iPads must first download the app. For many years, William Hill have not only been known as a provider of sports bets, but additionally operating a high quality online casino and a popular poker arena. A highlight among the virtual gambling selection of William Hill is surely the network jackpots, where customers can reap the rewards of outstandingly high winnings. In our sports betting test, William Hill performed well, with the top rating “Very Good”. The bookmaker is one of the most respectable in the entire market. Their betting selection is extensive and distinguishes itself above all in the depth of its football bets. The odds are exceptionally good and the customer support is also excellent. We also noticed that William Hill are striving towards acquiring more customers at the moment. Light deductions must be made for the design of the website, as well as the withdrawal period and lack of live-streaming in some countries.